Because we were on a camping trip, Tasmania’s state capital, Hobart, was kind of a hit-and-run. We saw some wonderful historic places, including the shot tower, and had a couple of hours to wander through Salamanca Place, but urban environments were not our focus. As a result, I feel I really need to return to Hobart someday to give the town a bit more time—especially since it is becoming well known for the innovative chefs using high quality local ingredients in an ever-increasing number of sensational restaurants. I’d also love to browse the famous Salamanca Market, an open-air market that sprouts each Saturday on the broad plaza that stands between the rows of historic sandstone warehouse buildings and the harbor’s edge. However, though we weren’t there long, we were there long enough to discover that Salamanca Place deserves its reputation as the local “scene,” the site of numerous delightful galleries and specialty shops, charming cafés, and a fair number of those innovative restaurants. 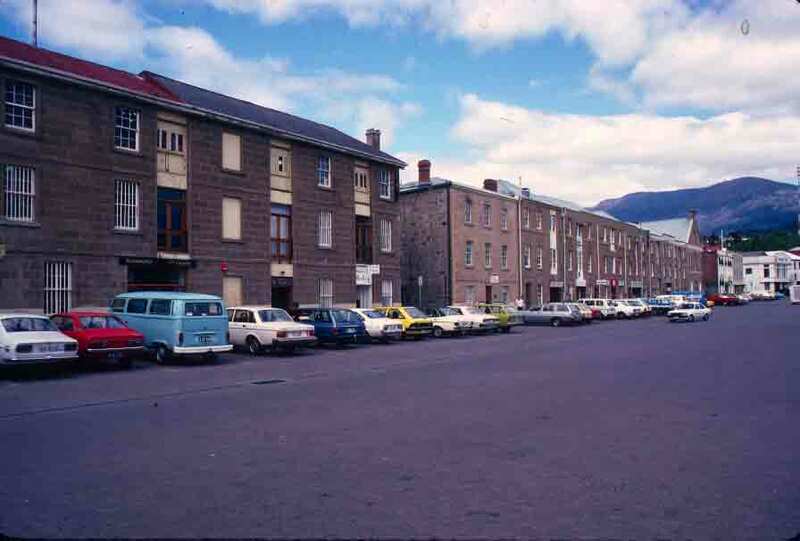 The photo below shows the stretch of Salamanca Place that faces the water, as well as part of the broad plaza that is home to the Saturday market. Originally, musket balls, grape shot, and other smallish round projectiles were produced in molds. This was slow work and more often than not resulted in flawed, uneven shot that was not particularly reliable and could even be dangerous. So a better way of creating shot would be an important invention. About the same time Britain was pulling the last of her forces out of the newly independent United States, and a few years shy of Britain heading for and claiming Australia, a British plumber named William Watts was watching dripping water, and he noticed that the water droplets became perfectly spherical as they fell through the air. He ran home, added a few more stories to one side of his house, and started experimenting with trying the whole spherical drop concept using molten lead. It worked. The liquid lead became spherical while falling and hardened into that shape when it hit the bucket of water Watts had waiting for it at the bottom of the tower. By using different sizes of colander, he could produce different sizes of drips and therefore of shot. And so was born the shot tower. The Industrial Revolution had been in full swing for some time, and people had gotten accustomed to happily hopping on the latest invention, and shot towers were no exception. When Thomas Jefferson got Congress to pass the Embargo Act in 1807, with the hope that it would keep Britain and France from hurting U.S. shipping, it spelled the end of importing British shot. 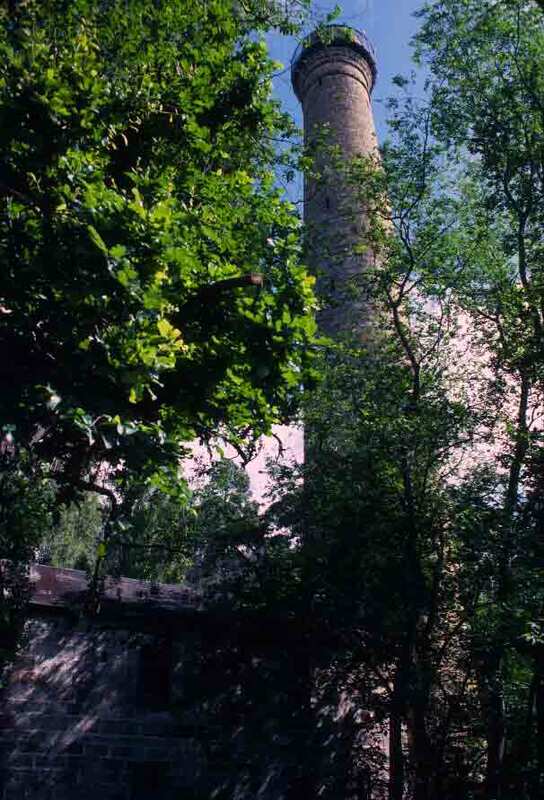 The first shot tower built in the U.S. was the Sparks Shot Tower in Philadelphia, which was completed in 1808. In this tower, tons of ammunition was produced during the War of 1812 and the Civil War. The Sparks Shot Tower was actually in operation until 1903. The first shot tower built in Australia was the one I saw along the banks of the Derwent River, just outside of Hobart. It is a remarkably handsome shot tower, and is the tallest in the Southern Hemisphere. An enterprising Scot named Joseph Moir constructed it almost single-handedly, completing it in 8 months and dropping his first shot in September 1870. Moir’s factory produced shot for contemporary muzzle-loading sports guns. Moir died four years after his tower was completed, but his sons took it over, and it continued to operate for 35 years. The tower is actually more impressive than you might guess from the photo below. Constructed of more than 8,000 individually curved and tapered sandstone blocks, it is more than 30 feet across at the base. The internal spiral staircase of more than 300 steps allows for enough space in the center of the tower to accommodate the falling lead droplets, and the tower is surmounted by a room that offered enough space to comfortably process the lead, and which now affords visitors stunning views of the surrounding countryside. World wide, there are a number of trees that are called leatherwoods, all quite different species. The tree so named in Tasmania is the Eucryphia lucida, a flowering tree that is endemic to Tasmania, thriving in the high rainfall area of Tasmania’s wild western forests. It grows mostly as an understory plant, crowding in among the forest giants. In the spring and summer, the leatherwood trees are covered with showy masses of white flowers that perfume the air. The flowers are lovely, but it is the nectar of these flowers that makes these trees economically valuable. They produce nectar abundantly—are in fact the single most important source of nectar in Tasmania—and in the summer, roads through the forests are often lined with beehives, as Tasmania’s beekeepers take advantage of the abundance. I had actually tasted Tasmanian leatherwood honey before I visited Australia, so I knew to take advantage of being in the heart of the area that produces this remarkable honey, though of course being in transit limited what I could buy. But I did buy myself a good size bottle and began enjoying it at breakfast the very next day. Tasmanian leatherwood honey is quite distinctive. It is pale gold, fragrant, with a creamy texture that melts in your mouth. Its taste is generally described as “spicy,” but to my taste, it is more specific than that—it is quite reminiscent of caraway. Fortunately, I can now get it in a few gourmet shops or on the Internet, so I don’t have to live without it between trips to Australia. So for a little taste of Tasmania, see if you can’t track down some Tasmanian leatherwood honey. If you fancy honey, I think you’ll be pleased. The combination of mountains and lots of water gives Tasmania an advantage over much of the rest of Australia. It was this combination that led to Tasmania being the location of the first hydroelectric power station in Australia—in fact, the first in the Southern Hemisphere and among the first few in the world. Tasmania seemed such a promising location for generating electricity that hydroelectric power stations kept being built until that fateful 1970s proposal to dam the Gordon River. Public opinion stopped that project and the threat of flooding the astonishing wilderness through which the river cuts. However, plenty of dams had been built before then—enough that Tasmania makes a significant contribution to meeting the electrical needs of mainland Australia. Most of the dams and power stations are in remote areas. Some have been built underground, so they can’t be seen and don’t spoil the scenery. One could visit Tasmania and hardly be aware of them—unless one went looking for them. However, we did go looking for them, and because I love seeing how things work, love going behind the scenes and seeing the mechanisms behind things, I was delighted. We visited the historic Tarraleah Power Station. This station opened in 1938 and is the oldest power station still operating in Tasmania. Despite its age, it has one of the highest energy outputs in the state. 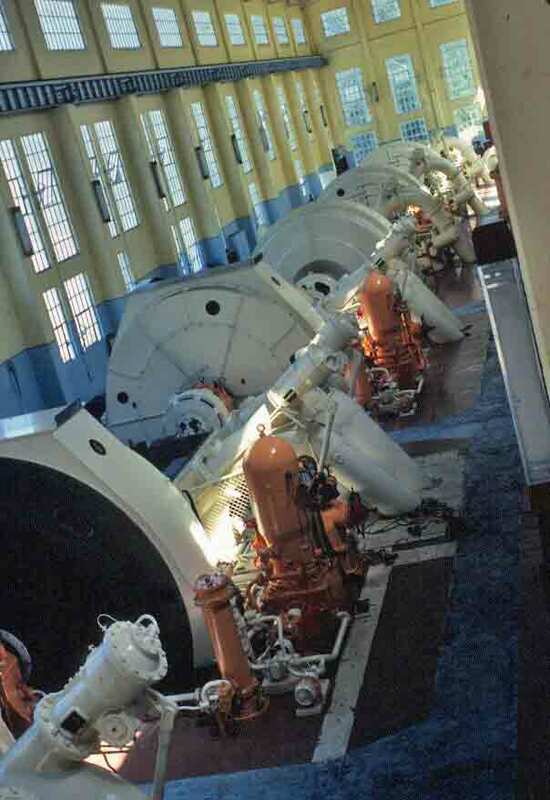 The huge turbine engines were impressive, and hearing them hum as they turned the rushing water into electricity was exciting.